59 ¾ by 67 ¼ inches (152 by 170.5 cm. Rudolf Schrey, Fritz Boehle: Leben und Schaffen eines Deutschen Künstlers, Frankfurt am Main, 1925, p. 19-20, illustration no. 56. Robert Bock, Fritz Boehle: Das malerische Werk, Weimar, 1998, p. 47 and 217, illustrated p. 135 no. 26. Fritz Boehle was born in Emmendingen on February 7, 1873. The family moved a year after his birth to Frankfurt, where his father worked as a merchant. In 1886 he attended the Städel Art Institute where he was a colleague of Rudolf Yelin, who attributed the younger Boehle as a major influence on his own work. In 1892 Boehle moved briefly to Munich, but soon returned to Frankfurt. Conrad Binding, the founder of the Binding Brewery, was a major patron and commissioned numerous works from Boehle. The artist died October 20, 1916 in Frankfurt am Main from diabetes, which at the time was untreatable. Fritz Boehle was influenced by the drawings of Albrecht Dürer, as can be seen in many of his etchings as well as in the present work, The Potato Harvest. 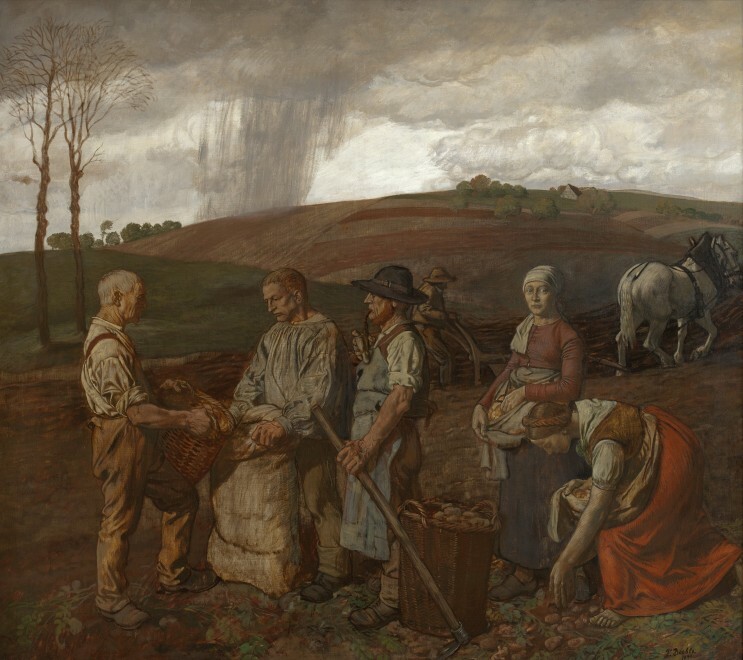 However, his works also show the influence of his fellow Frankfurt painter Otto Scholderer (1834-1902) and Hans Thoma (1839-1924) who lived in Frankfurt am Main from 1876 to 1899.The artist is best known for his paintings of farmers in the field and animals. Several of his drawings were turned into large public sculptures, such as the life size bronze Taurus in Güntherburghpark in Frankfurt.